I can’t believe it’s been almost a year since I started blogging and trying to be more of a nonconsumer. I really can’t believe that I have managed to blog consistently. I know sometimes the posts are a little… prosaic, but I like having a record of my life, dull as it may be sometimes. 1. I’ve been composting and recycling at a high level. My trash can has not seen a scrap of fruit, veggie, paper, or plastics #1-5 in months. At other people’s houses, I take things out of the trash and move them to the recycling container. I pick up trash on my way to and from my son’s school. OCD can be harnessed for good! 2. I’ve learned that whatever I may be looking for, there is a high possibility it is in my house already somewhere, or in my mom’s house. I just have to find it. I most likely do not need to buy it. 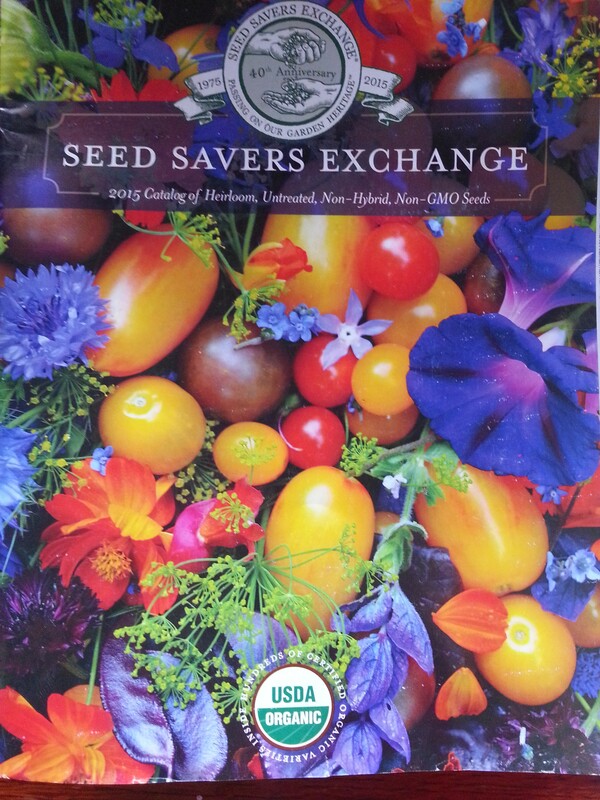 I can’t wait to order seeds. Pumpkins in 2015 or bust!! 4. I can’t do it all, but I can do more than I think, and nearly anything is worth trying once. 5. Thrift stores rock. The variety is fun; you aren’t limited to this year’s trends. The prices can’t be beat. And where I once felt that as a middle-class person, maybe I was encroaching on the poor by shopping at thrift stores, I now realize there is sooo much stuff in these stores that there is plenty for all. 6. The budget is king. If I just glance at the budget everyday, I’m less likely to go astray. The numbers don’t lie. Either you save money each month or you don’t. You can buy organic, plant a big wonderful garden, sew your own clothes, and end up in the red. You could also eat at McDonald’s every day, shop Walmart and Target and the Dollar Store, and be in the black. I want to be in the black, but also be healthy, socially conscious, environmentally friendly, and self-empowered. I’m still figuring out this terrain. Every choice leads to more questions. If I have to get so-and-so a gift, is it better to have it shipped from Amazon using promo codes and eBates? To make it myself? To buy from a local artisan? Should we just go out for coffee and eschew gifts? Is that coffee responsibly grown and are the coffee shop workers paid a fair wage? Should we just have coffee at my house? Will the oceans eventually fill up with Keurig pods? Does that creamer come from a free-grazing cow? Ha ha, but seriously. Let’s keep making the best choices we can. So what’s on tap for 2015? I’m really in the mood for a change, which I figure will come in the form of a baby, a dog, a new house, a massive renovation of this house, or an online class, or some combination of those. None of these things really lend themselves to outright frugality, but they still can happen in a frugal manner. I also have an idea cooking for this blog, which I’ll talk about later if I decide to do it. On the strictly frugal tip, I resolve to be stricter with the monthly budget and with socking money away. I resolve to eat out less and use convenience foods less and to open the fridge door with the question, “what food that is about to go bad can we eat up right now?” Because throwing food away is truly like throwing cash in the garbage, and shouldn’t happen. I also resolve to make the house more energy efficient. I know I’ve been saying that forever. It’s not fun like baking and crafting. But it Has. To. Happen. I resolve to hone and practice my skills in areas where skill is critical, like cooking and cutting hair. I resolve to show my gratitude for the great things and people in my life. I also resolve to admit when I’m feeling down and things aren’t great, and not pretend like everything is cool. When I started this blog, the idea was to follow the Compact and not buy anything new. That concept broke down over the year, but I think I did learn a lot just by trying not to buy new. I won’t be making any hard-core resolutions like that this year. Although those kinds of extreme challenges can be exciting (no processed food for 30 days; the one-grocery-bag-of-trash-a-week challenge; etc. ), they are not realistic for my life. If anything, I might try a decluttering challenge like this one. Right now, I’m equal parts energized by all the amazing things that I could do in 2015, and paralyzed with indecision. Actually that sounds like how I am most of the time.